The latest issue of the Mensa Research Journal, Mensa's triannual publication of scholarly articles related to intelligence, is devoted to the work of Howard Gardner. This dedication follows Howard Gardner's receipt of the Mensa Lifetime Achievement Award in 2017. 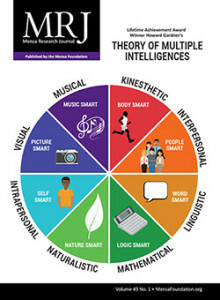 The issue features eight research articles related to the theory of multiple intelligences, including a previously unpublished address Howard Gardner delivered upon receiving an honorary degree from José Cela University in Madrid, Spain, and the Prince of Asturias Prize for Social Science in Madrid, Spain.